Trident vote: are unions reverting to their traditional role, backing the Labour Right? Jeremy Corbyn has suffered his first defeat as Labour leader: and it’s been Unite and the GMB who’ve brought it about. 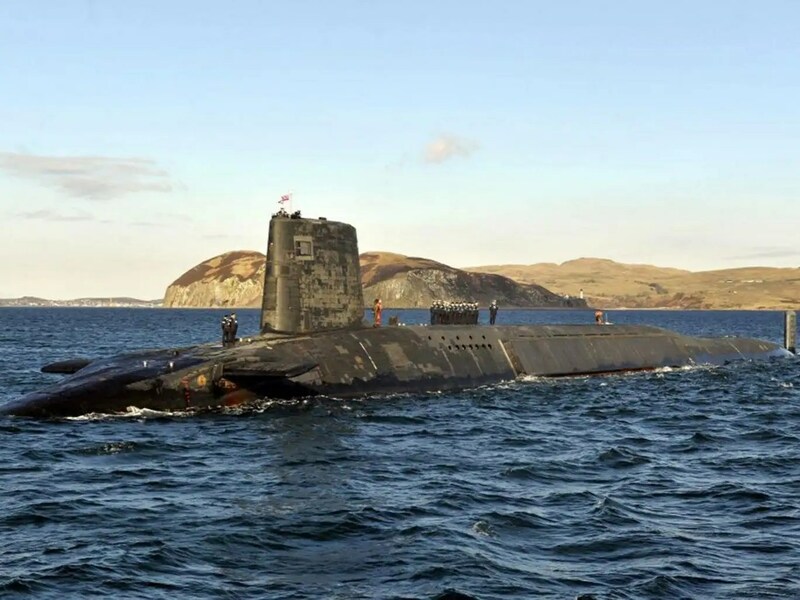 The decision by delegates at the Party conference not to have a debate on Trident came about because Unite and the GMB, with tens of thousands of their members’ jobs dependent upon the renewal of the nuclear weapons system, made it clear that they’d vote against any anti- Trident resolution. The embarrassment of the Morning Star aside, the significance of the votes of Unite and the other major unions on this issue, is that they seem to be reverting to their traditional role as bastions of right wing pragmatism, against the leftist idealism of much of the Party’s rank and file (although, having said that, only 7.1% of constituency delegates voted for a debate on Trident). It also points to the failure of the anti-Trident left to deal effectively with the questions of jobs: Unite and the GMB in reality regard Trident as a massive job creation scheme and so far (beyond vague references to the Lucas Alternative Plan of the 1970’s) the left has failed to come up with a convincing answer. Meanwhile the GMB’s recently-knighted buffoon of a general secretary, ‘Sir’ Paul Kenny has lined up with Labour’s Europhobes (some of the most right wing people in the Party) in urging the Party to “keep its options open” on EU membership and, in fact, campaign for withdrawal if Cameron’s renegotiation results in any weakening of British workers’ rights – quite how leaving the EU will prevent the Tories attacking workers’ rights in Britain is not explained by Kenny or his europhobic friends. In fact, Corbyn’s recent clarification on Europe (stating that he “cannot envisage” Labour campaigning for withdrawal and that the Party will re-instate any workers’ rights bargained away by Cameron) is plainly the only rational left-wing position. For all his fake-left posturing, Kenny’s position on Europe (like his position on Trident) is, objectively, an attack on Corbyn … from the right. It’s time for Corbyn’s supporters to start organising seriously in the unions. Last winter there were some reports that people had starved to death in Eastern Ukraine. The reason was that humanitarian aid was being stolen by the criminals who run the so-called Donetsk and Luhansk ‘People’s Republics’ (DPR/LPR).The insidiousness of Russian propaganda is shown by what you’ll find if you look for that information, which is widespread Western media reports of deaths being blamed on Ukraine and not the ‘rebels’. 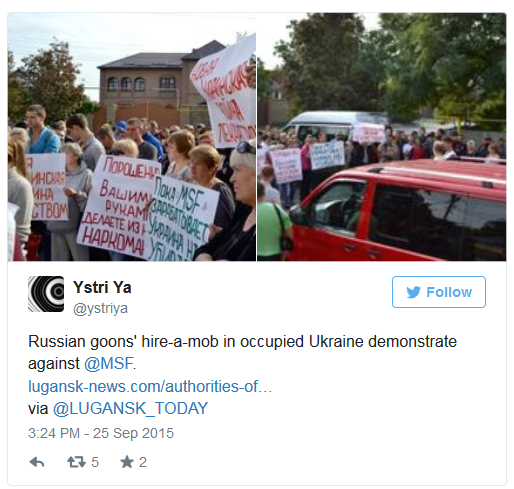 This is because Ukraine stopped social payments and because some truck convoys were blocked. That humanitarian aid to the Donbas was being stolen was the claim of former rebel leader Igor Girkin on Russian TV. 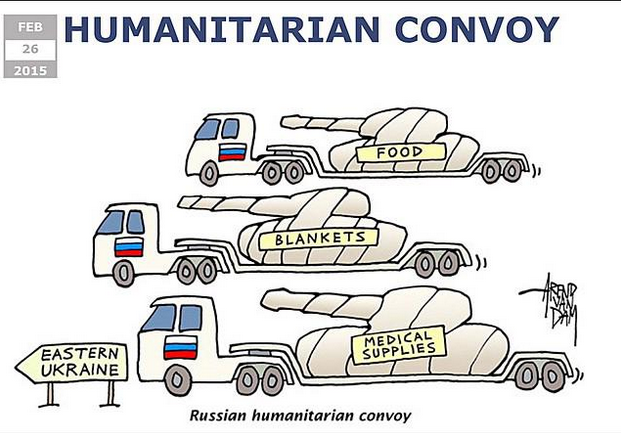 Another rebel commander, Pavel Dremov, said that only one in ten of Russian aid convoys actually reached the people. Trucks supposedly delivering aid through Ukrainian checkpoints have been found to be carrying alcohol instead. International agencies operating in the Donbas have come under increasing pressure. Monitors from the OSCE, there because of agreements signed by the ‘rebels’ and by Russia, have been harassed and had their vehicles destroyed. In April the International Rescue Committee, which looks after refugees, was expelled after being kidnapped and accused of ‘spying’. Aid from the European Union that does get through has been repackaged to appear to come from the ‘republics’. Now, just weeks before temperatures plunge, the rebels have expelled every single international aid body bar the Red Cross – and Russian groups. This includes the United Nations and Médecins Sans Frontières. The Red Cross may be next given that they have been harassed in the past. Sick children deprived of essential medications, patients forced to undergo surgery without anesthesia, and food prices so high that many residents can’t afford to eat properly. The UN also said that when the ‘rebels’ switched pension payments to rubles they “duped” pensioners by rigging the exchange rate. 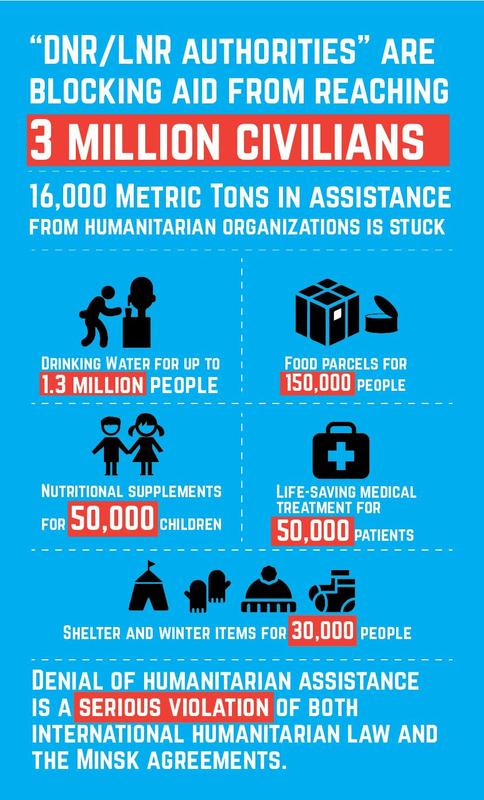 Some 150,000 people are not receiving monthly food distributions, 1.3 million people’s access to water is at risk, and more than 30,000 people have not received shelter materials and household items they urgently need. Those most at risk are in the villages and small towns, especially in the east. Well away from Donetsk itself, so unlikely to be seen by Western journalists. 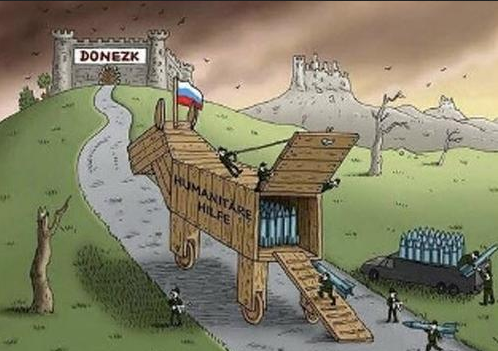 Much trumpeted Russian humanitarian aid convoys have time and again been found instead to contain weapons. Just let that sink in. So because of politics, because of ideology, because of paranoia their ‘people’ can be sacrificed? The mentality that ‘foreign’ organisations must be a threat of course comes from Russia, where numerous human rights and even scientific groups have been effectively closed down after being labeled as ‘foreign agents’. It is also indulged by many in the West who think that Russia is ‘surrounded’ and at risk of a Western supported ‘colour revolution’. Russian TV (all the people in the Donbas are allowed) is devoted to feeding this paranoia so of course a benign humanitarian group like Doctors Without Borders cannot be what the sane people reading this blog post see it as. No, it must be peddling ‘illegal psychotropic drugs’! But these are the lunatics that the likes of Unite’s Andrew Murray, the RMT union and Stop The War Coalition’s Lindsey German (and many, many others) are supporting. So called ‘anti fascists’ who think the UN will foment counter revolution and who are prepared to see their ‘citizens’ starve or die in agony, the weakest among them first. Thousands will die because of this decision. It is not like there has not been fair warning aplenty before but this should be the final straw. ‘Solidarity with the Anti-Fascist Resistance in Ukraine’ should shut up shop and anyone on the left who continues to back these people deserves to be shunned. Ukrainian billionnaire Renat Akhmetov’s humanitarian aid is also not affected by the ban. Jock Mendoza-Wilson from Akhmetov’s Foundation is reported to have suggested that the militants are hoping to receive humanitarian aid from Western countries via Russia. His idea is that the aid would be presented as though from Russia. It seems difficult to believe that western agencies would agree to this, especially given that they would be in breach of Ukraine’s law on temporarily occupied territory if they entered such territory from Russia, without Ukraine’s permission. I am responding to your “Letter to a Jeremy Corbyn supporter” (8 September), and subsequent statements by your organisation in which you basically tell “The tens of thousands of people who cheered Jeremy at his rallies [who] are a sign of the potential for a mass movement against austerity” that they are wasting their time. I don’t share your analysis. While not destroying them, the effect of Corbyn’s campaign has been a disaster for the Parliamentary Labour Party and the trade union leaderships who have worked hard to maintain the wall between what Labour does politically and the rest of the labour movement. Yes, his candidacy was a fluke and the Labour Party left is woefully unprepared for the fight against the right, both inside and outside the party. It is an indication of the weakness of whole left over decades, but we have to start from where we are and make the most of this chance. Even in your worst case scenario and Corbyn is “destroyed” in four years time, the revolutionaries in the Labour Party will still have been struggling alongside hundreds of thousands of others for that period. People can learn from defeat as much as from victory; but to learn from either revolutionaries need to go through the struggle and having done so will get a much more receptive hearing than if you are one of those revolutionaries who remained on the sidelines as a spectator. There is then the possibility of raising the movement to a higher political level but only if there are enough revolutionaries trying to spread that message. For all your talk about the undoubted necessity for struggle you back away from the political struggle within the Labour Party to move it to the left. “The real danger is that Corbyn supporters are plunged into internal party struggles…” Except that this lack of internal party struggle is precisely what has made the Labour Party the top-down neo-liberal supporting organisation it is today. The struggle inside the party can be a part of the more general struggle to rouse our class against the Tories. If “…resistance… [is] … the best route towards political radicalisation” why doesn’t that apply inside the structures of the hundreds of thousands strong Labour Party as well? Your dismissal of the need for internal party struggles illustrates the operational mindset of the SWP’s leadership who can just tell the membership what to do without having to “waste” all that time on debate and democracy. Happily there are Corbyn supporters who understand that a healthy political organisation cannot be built be decree or decide what to do in the “… struggles at work and in working class areas” by diktat. Socialists should be encouraging Corbyn’s supporters to flood into the Labour Party, get organised and tear down the wall before the Parliamentary Party has time to rebuild it. You say, “We should all support [Corbyn] against the Labour right”; if you’re serious about that then join the Party and encourage your members and supporters to do the same. 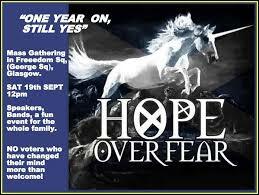 One of the by-products of the Scottish referendum was the re-emergence of Tommy Sheridan (name usually prefixed by “disgraced perjurer) who has refashioned himself from socialist to nationalist trying to lead a popular movement called Hope over Fear. Having been refused permission by Glasgow Council to hold a rally in George Square, Glasgow (which the Yessers like to call “Freedom Square”) the rally went ahead anyway. Here is a sharp and observant – and rather moving – account of the event at A Thousand Flowers. I would guess the writer is a former colleague of Sheridan’s. S/he is anxious at the kind of nationalism arising in a movement which took pride in its distance from the blood and soil kind. One speaker told the crowd about how “We had repelled the Vikings…and the Danes” coz obviously, a Scotland which gets rid of foreigners is something to be celebrating in the current context. “Water is going over the border…whisky revenues are at an all time high.”As he furiously bellowed about “traitors”, a woman behind me shouted “burn the Witch” and I breathed a sigh in relief, realising I wasn’t alone in finding all this slightly troublesome. The Atheist group is of course appealing their decision, however, it’s important for me to comment briefly on the Student Union’s position. I will be writing a more detailed letter to the university to formally complain about the Student Union accusations against me after taking legal advice. For now, though, suffice it to say that criticising religion and the religious-Right is not incitement of hatred against people. If anything, it’s the religious-Right, namely Islamism in this case, which incites hatred against those of us who dare to leave Islam and criticise it. It is the “anti-colonialist” perspective which always unsurprisingly coincides with that of the ruling classes in the so-called “Islamic world” or “Muslim communities” – an understanding that is Eurocentric, patronising and racist. This type of politics denies universalism, sees rights as ‘western,’ justifies the suppression of women’s rights, freedoms and equality under the guise of respect for other ‘cultures’ imputing on innumerable people the most reactionary elements of culture and religion, which is that of the religious-Right. In this type of politics, the oppressor is victim, the oppressed are perpetrators of “hatred”, and any criticism is racist. Well, it’s not up for sale or subject to the conditions of a Student Union too enamoured with Islamism to take a principled position. By the way Warwick, in case you’re wondering, I will speak at your university – as I will be soon at Trinity College Dublin despite my initial talk being cancelled by organisers. The scandal at Volkswagen (VW) over the manipulation of emissions readings from its autos in the US has plunged the firm into a major crisis. The company, which along with Toyota is the world’s largest auto producer, faces the threat of up to $18 billion in fines, along with massive costs related to the recall of almost half a million vehicles and huge compensation claims. The US Justice Department has launched a criminal investigation and a congressional committee has announced plans for a hearing on the scandal. VW has already acknowledged that accusations by the US Environmental Protection Agency (EPA) are valid. It has admitted that it deliberately deceived American customers and government authorities. In a calculated manner, VW broke the law in order to manipulate emissions readings. In diesel models sold in the US, the company installed specially developed software to enable the vehicles to determine when they were being tested and automatically switch to a mode that reduced the emission of pollutants. After the test, the cars automatically switched back to the normal mode, increasing their release of poisonous oxides between 10- and 40-fold. VW used the low emissions test rates as a selling point for the US market, where diesel cars comprise just one percent of total sales, a far lower percentage than in Europe. Many US buyers decided to purchase a diesel car from VW or Audi because, in contrast to hybrid vehicles from Asian producers, which have low emission rates but are cumbersome, the German models were considered both environmentally friendly and sporty. Northern Irish power-sharing institutions look close to collapse, following a crisis sparked by the murder of former IRA member Kevin McGuigan on 12 August in the Short Strand area of East Belfast. McGuigan’s murder is widely seen as a revenge killing for the murder in May of Gerard “Jock” Davison, at one point one of the IRA’s most senior commanders in Belfast and allegedly responsible, along with McGuigan, for much of the IRA’s vigilante violence against drug dealers in the mid-to-late 1990s. After the two men fell, an internal IRA disciplinary unit “sentenced” McGuigan to a “six-pack” — republican parlance for gunshot wounds to each of the elbows, kneecaps and ankles. For years, McGuigan blamed Davison for the punishment shooting, and last May decided to get revenge. Davison was shot outside his home in the Markets area, near Belfast City Centre. With a police investigation stalling, the IRA placed their own surveillance team on McGuigan and decided to avenge Davison’s death. McGuigan was ambushed by two men in dark clothing as he was walking with his wife, and killed in a volley of shots. A number of factors explain why these killings have sparked such an intense political crisis at Stormont. In a press conference following the McGuigan murder, Police Service of Northern Ireland chief George Hamilton made it clear that the police blamed individual members of the Provisional IRA for the murder. No one should have been surprised by the admission of the Provisional IRA’s continuing existence. Even though Sinn Fein say publicly that the IRA has “left the stage”, no movement of this type could have moved from armed struggle to politics without maintaining a military structure with sufficient authority to rein in “hardliners”. Without this, the movement would have descended even more than it already has into a collection of local fiefdoms motivated by apolitical criminality or, worse, a continuation of sectarian warfare. It is remarkable that there has not been more internecine republican violence during the Provisional’s transition to politics. The anti-Good Friday Agreement groups, though deadly, remain little more than an irritant. In truth, the significance of the McGuigan murder lies ultimately in political rivalries within Unionism. In the last decade, the IRA has been involved in two high-profile murders (those of Robert McCartney in 2005 and Paul Quinn in 2007), both a testament to its capacity for sheer gangsterism and violence. Both victims were thrown under the juggernaut of the “peace process” by republicans, Unionists and the British government, to ensure power-sharing between Sinn Fein and the DUP. So what has changed? The Northern Ireland Executive has failed to deliver on any of the promises made to people about a “peace dividend”, instead locking itself in sectarian wrangles over parading, flags and other issues of identity, as well as attempting to implement Tory austerity. This has largely sapped any enthusiasm that once existed for Stormont across both communities. Added to this is a reasonable fear among Nationalists that many Unionists continue to be hostile to power-sharing. Sensing this, the smaller Unionist party, the Ulster Unionist Party (UUP), opportunistically seized the chance to reverse its political fortunes after a decade of marginalisation, and piled the pressure on the dominant Democratic Unionist Party (DUP). With one eye on the 2016 elections it pulled its one minister out of the Northern Ireland Executive — a move highly popular with over 80% of Unionist voters. Stunned, and after failing to suspend Stormont pending crisis talks, the DUP felt in turn reluctantly obliged to pull its ministers out of the Executive, effectively shutting down the working of the devolved government which has provided such material benefits to the party in the form of ministerial salaries, expenses and other privileges of office. This clownish play-acting, which has always been implicit in the very structures of Stormont, risks the return of Tory direct rule, the implementation of savage welfare cuts and an intensification of sectarian tension. A political system based on institutionalising sectarian identities within the existing boundaries of the six counties has become unable to provide adequate governance of any sort, let alone a space in which workers can elaborate a socialist politics capable of a democratic resolution to the national question. Cameron and the pig: how much did Brooker know?